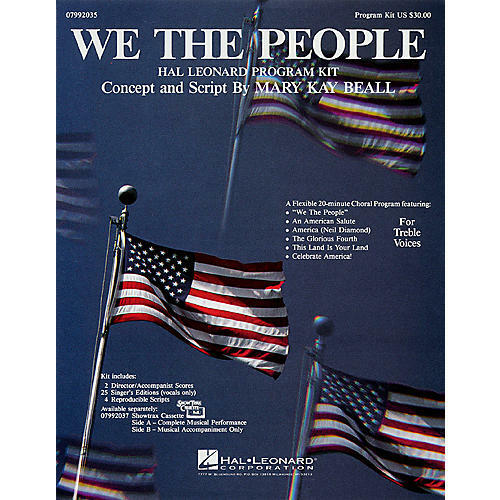 Celebrate America with this patriotic program kit developed by Mary Kay Beall that includes a variety of original songs and fresh arrangements of old favorites for unison/2-part singers. Titles include: We The People (Brymer), An American Salute (arr. Lojeski), America (by N. Diamond, arr. Averre), Glorious Fourth (arr. Averre), This Land Is Your Land (arr. Muller) and Celebrate America (Brymer). With this program kit, you will receive 2 Director's Scores, 25 Singer's Editions, and 4 reproducible scripts (with costume and prop suggestions). Available: Unison/2-Part and ShowTrax CD.